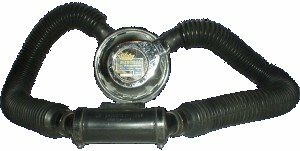 The Spirotechnique Royal Mistral is a single-stage twin hose regulator. This particular one has had the straps from the mouthpiece cut off. This is the classic twin-hose regulator. It is the successor to the Spirotechnique Mistral, which only had a short production run. In contrast, this regulator was listed in the Spirotechnique catalogue until only a few years ago. In addition to the basic design of the original Mistral, the Royal Mistral features a port for a pressure gauge, and non-return valves (known as Aquastop) in the mouthpiece. This makes it easier to clear water from the hoses, and reduces the dead-space. The original Cousteau-Gagnan regulator design was a two stage system, with both stages mounted in one casing on the cylinder. These production regulators, however, have only a single stage. Internally, it is much like the second stage of a modern regulator. 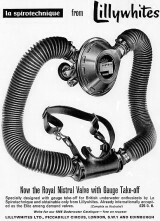 The Mistral design was produced by a number of other companies, including US Divers, and Siebe-Gorman. The latter of which produced many variations. The notable internal features of the Mistral are the double levers, one over the other, and the adjusting screw on the bracket that holds the levers. These are the levers that open the valve to allow air to flow when the diaphragm is depressed. The adjustment screw can only be turned when the casing is open, i.e. it cannot be adjusted during a dive. Having twin hoses allows the exhaust valve to be placed as close to the diaphragm as possible; thus, reducing the problem of either the valve free flowing, or not providing air at all. Increasing the depth of the regulator with respect to your lungs (by turning to the side) makes it easier to breathe from. Turning all the way onto your back causes the regulator to gently free flow. Since the exhaust valve is on the diver's back, it is said to be useful to underwater photographers who find that the bubbles from a modern valve are in the way, or scare the subject. La Spirotechnique Royal Mistral has a simple round case design, and a beautiful chrome-plating finish. Truly a gorgeous piece of equipment. 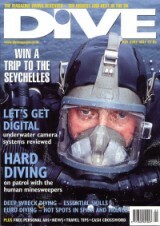 This regulator, and some associated text appeared in a feature (Dive Classics) in Dive magazine, May 2002, p66. This is an advert for the Spirotechnique Royal Mistral, placed by Lillywhites in Triton magazine in the 60's. Click the image for a larger view. In this image the mouthpiece straps can clearly be seen.